Located in Orlando Florida. The Fifth’s sleek and modern design capture patrons right as they walk in the door with the beautiful white rock finishing adorning the walls front to back, stylish LED Onyx bar and columns and dynamic lighting throughout. Impact Lighting Inc. worked closely with the owners to create different lighting environments for the Galaxy Design System ceiling panels. To achieve this, Impact Lighting Inc. CNC'd a custom Clear Form ceiling panels that illuminated the interior design elements of the space internally with both white and color-changing lighting to create distinct looks. During the day the space uses white light, with a hint of color shining through the Clear Form ceiling panels. While at night, Clear Form Galaxy Design System panels come alive and bathe the space with bold colors. Located in Apopka Florida. Impact Lighting Inc. fabricated and installed custom its popular Galaxy Design System lit wall panels throughout the new expansion project. 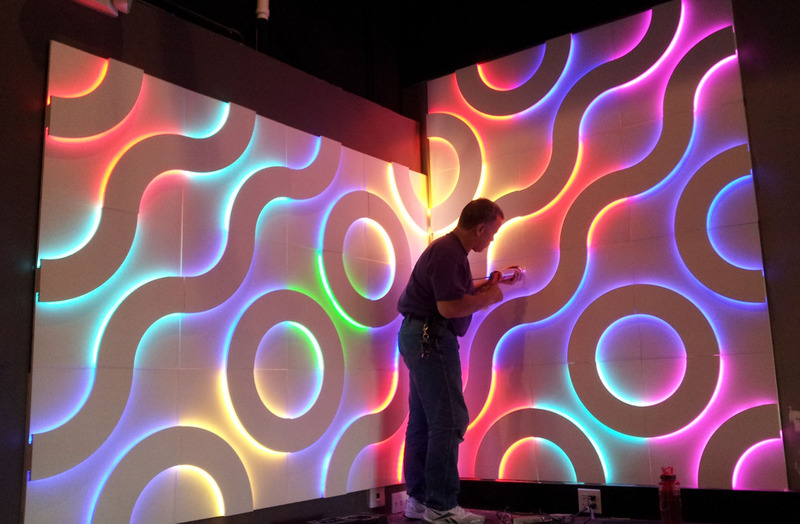 Impact used Color Changing LEDs in the wall pattern inorder to create a beautiful colorful glow at new bar area. These colorful treatments along with the concealed wall lighting and other lighting details created one of Impact Lighting Inc.'s most memorable restaurant designs. Located in South Beach Miami, Florida. Impact Lighting Inc.fabricated custom galaxy LED lighted walls to be installed at the new night club along with its evermore popular fiberoptic concrete bartops. the LED color changing Galaxy System walls punctuate many of the decorative elements throughout the bar and club. Located in the heart of the ultra trendy Lake Eola District, Orlando, the lighting column design in Mezz's banquet hall is a stunning never before seen lit feature. The unique lighting columns create a fun and electrifying environment in which patrons get the feeling of walking through an art gallery as well creating visual experience in the ballroom. As customers approach the dance floor they are presented custom, stylized mirrored wall infused in grays and black. .
Rangetsu" is an exciting and energetic restaurant designed for patrons who desire something different and unique" stated Mike Rowen, owner of Legacy Construction. "Impact Lighting's creativity and approach to design was instrumental to the successful outcome of this project..